Mary Shelley’s Frankenstein has held a place in the popular imagination for 200 years. Join us for an evening exploring two themes from the novel and their relevance to today’s world. First, discover ways the monster is represented in Queer art and how its descendants find their way into contemporary culture and media with Charlie Fox, author of This Young Monster. Next, Rosalind Williams, Bern Dibner Professor of the History of Science and Technology, Massachusetts Institute of Technology, talks about the conundrums posed in the novel—how can we exercise responsibility in a world of innovation beset by unintended consequences? The exhibition It’s Alive! Frankenstein at 200 will open at 5:30 pm for program attendees. 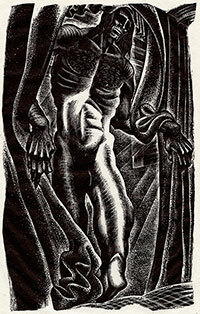 Lynd Ward (1905–1985), The Monster and Victor Frankenstein Encounter Each Other in the Swiss Alps, in a Field of Ice The Newly Created Monster Tries to Get into Victor Frankenstein’s Bed, proof wood engravings for illustrations in Mary Wollstonecraft Shelley, Frankenstein; or, The Modern Prometheus, New York: Harrison Smith and Robert Haas, 1934. Eberly Family Special Collections Library, Pennsylvania State University Libraries.Lynd Ward Wood Engravings and Other Graphic Art, Collection #9392, Special Collections Library, University Libraries, Pennsylvania State University. $15; 10 for members; free for students with a valid ID.